When you create an SSL website, Alert Logic Managed Web Application Firewall (WAF) gives this website a temporary SSL certificate. You are able to substitute the temporary certificate with a signed certificate. These actions are only intended for SSL enabled website proxies. To create an SSL website, see Add a website. For more information about configuring a website, see Configure Alert Logic Managed Web Application Firewall (WAF). When you create a website proxy for an existing HTTPS web server, you need to export the SSL certificate from the web server, and import the certificate to Managed WAF. PKCS12 (or PFX): The standard format used by Microsoft IIS servers. It stores public key, private key, and the key chain in one single encrypted file. Intermediate: A subordinate certificate where the chain begins at the trusted root, through the intermediate and ending with the SSL certificate issued to you. The links below open procedures that refer to third party products and guidelines and may change at the vendors discretion. When you export an SSL certificate from a Microsoft IIS server, the certificate is usually obtained in PKCS12 (.pfx) format. The instructions for exporting from IIS 7 below will include the SSL certificate chain. Open the Windows Start menu. In the Search box, type MMC and click OK.
Click the File tab and then select Add/Remove Snap-in. Click on Certificates, and then click Add. Select Computer Account, and then click Next. Select Local Computer and click Finish. In the center pane, double-click Certificates (Local Computer) in the center window. Double-click on the Personal folder, and then click Certificates. Right-click the certificate you want would like to backup, and then select ALL TASKS and then Export. Select Include all certificates in certificate path if possible. (do NOT select the delete Private Key option). Type a password you will remember, and then save the file. Click Finish. You will receive the following message, "The export was successful." For Apache-based web and application servers with default PEM encoding, the SSL certificate can be copied directly from the file system and imported “as is” when the default PEM encoding is used. Obtain the SSL-certificate file from the web servers file system. By default, the file is PEM-encoded. Keep the contents of the files open. You will need it for the PEM (Apache) certificate upload section. When you create an SSL website, Managed WAF assigns the website a temporary SSL certificate. You are able to substitute the temporary certificate with a signed certificate. On the Websites page, select the website you want to view. In the main menu, highlight ADC, and click Virtual Host. Click Manage Certificates. The SSL certificate currently in use is displayed. To upload a new certificate, click Manage certificates. In the Options list, select Import SSL certificate (PKCS12 format). Click Choose File to browse your system for the file location. In Passphrase input, type the passphrase. 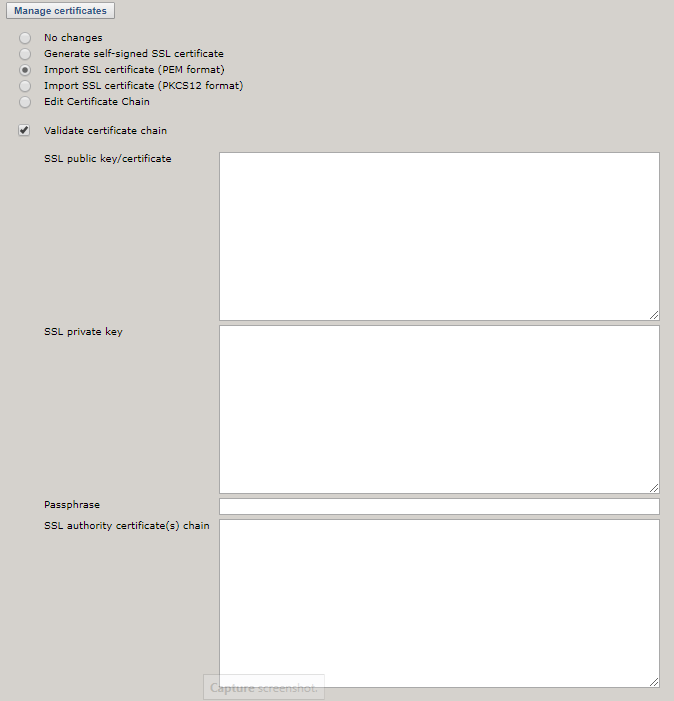 Leave Validate certificate chain selected. When checked, Managed WAF validates that the certificate chain is complete and ordered correctly. This option should only be cleared if the certificate import is generating certificate chain errors that need to be adjusted manually after import. Click Save Settings in the lower right corner of the page. Click Apply Settings at the top of the page to apply the certificate to the run-time configuration. Copy the public certificate section of the certificate into the SSL public key/certificate field. The public certificate is the section of the certificate file between (and including) the certificate start and end tags. Copy the (SSL) private key section of the certificate into the SSL private key field. The (SSL) private key is the section of the certificate file between (and including) the private key start and end tags. In the Passphrase, field type the passphrase for the private key (if the original private key was encrypted). (Optional) In SSL authority certificate(s) chain, if a certificate authority chain is provided with your certificate, enter the entire list of certificates (more than one certificate may be provided). Click Save settings. The imported certificate is displayed in the certificate table along with the certificate chain (if any). Verify that the certificate is imported correctly. The public key/certificate is the section of the certificate file between (and including) the certificate start and end tags.